The City of Roanoke, VA, integrated Laserfiche with its line of business applications. 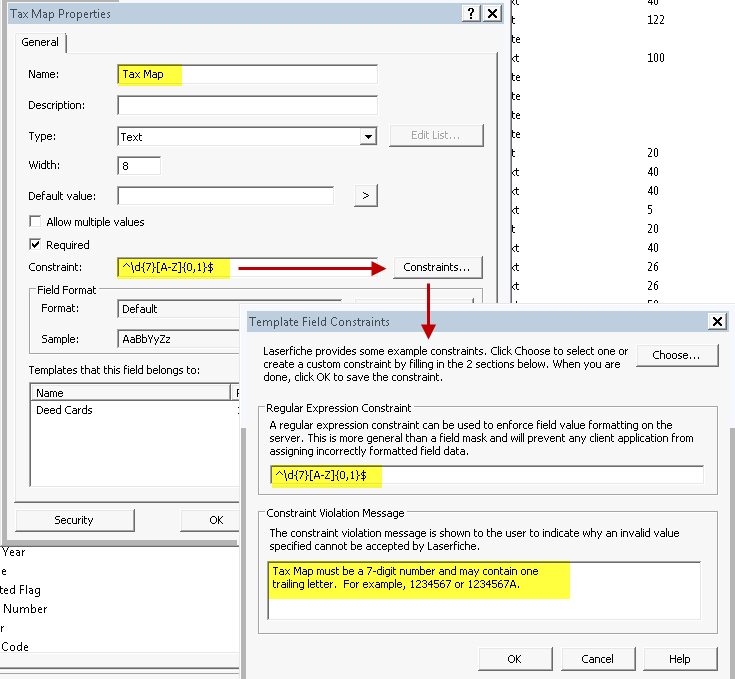 Here is how the integrations with IBM Lotus Notes and ESRI GIS are configured. The contracts department uses IBM Lotus Notes to keep track of all of the City of Roanoke’s contracts and leases. The actual contract document is stored in Laserfiche, but all contracts are administered through IBM Lotus Notes. 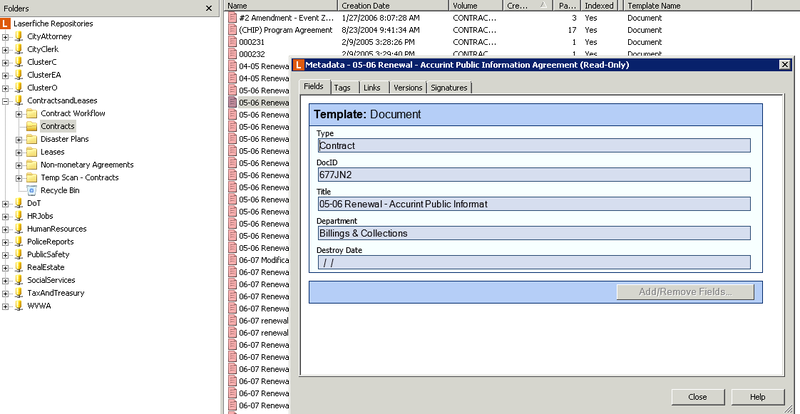 In IBM Lotus Notes, each contract or lease has a “View Imaged Document” button. Clicking this button opens all documents related to that contract or lease in Laserfiche WebLink. When the button is clicked, a search is performed in Laserfiche WebLink based on the Lotus Notes ID number of the document. Here is what the repository and document template look like. 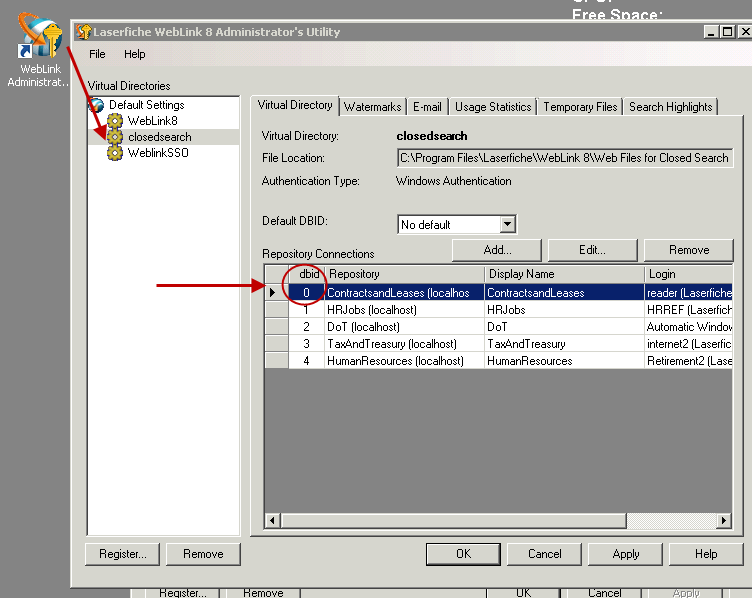 The DocID field corresponds to the Lotus Notes ID. Lf01 is the Laserfiche Server name. Closedsearch uses the closed search functionality. 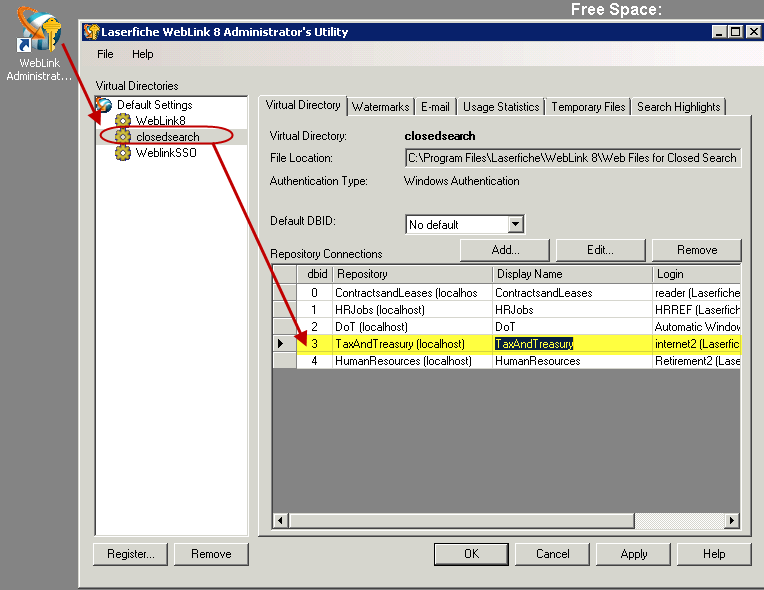 The database id (dbid) is obtained from the Laserfiche WebLink Administrator’s Utility. In this case, Dbid = 0 is the Contracts and Lease repository. 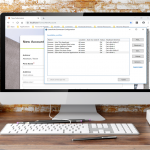 Since property records, such as engineering maps, permits and deed cards, should, by law, be accessible to the public for free, the City of Roanoke has integrated its ESRI GIS system with Laserfiche. 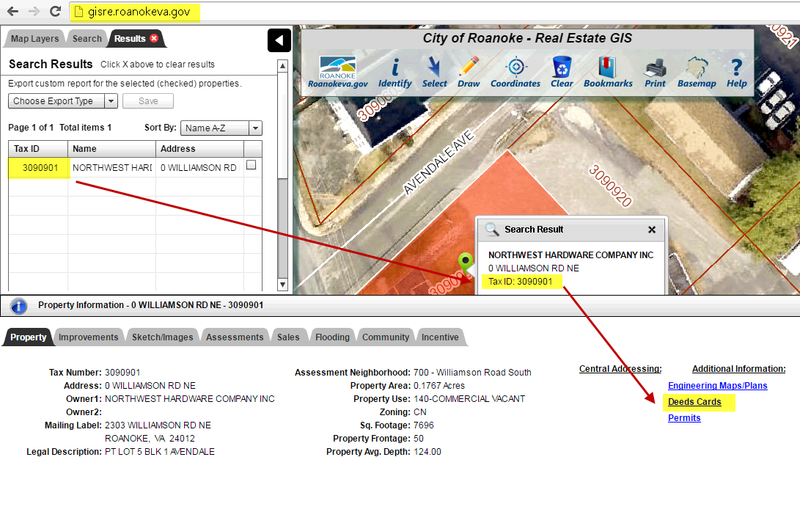 The main page of Roanoke’s website contains a GIS Maps and Real Estate link where citizens can view property parcels and all related documents. Once the link is clicked, the user can search by address and pull up all of the related documents stored in Laserfiche, such as deed cards. Each deed card is stored in the Laserfiche folder corresponding to the tax ID number. The tax ID number is stored in the Tax Map field in the document template. In order to make sure it is always accurate, regular expressions are used to format the field. 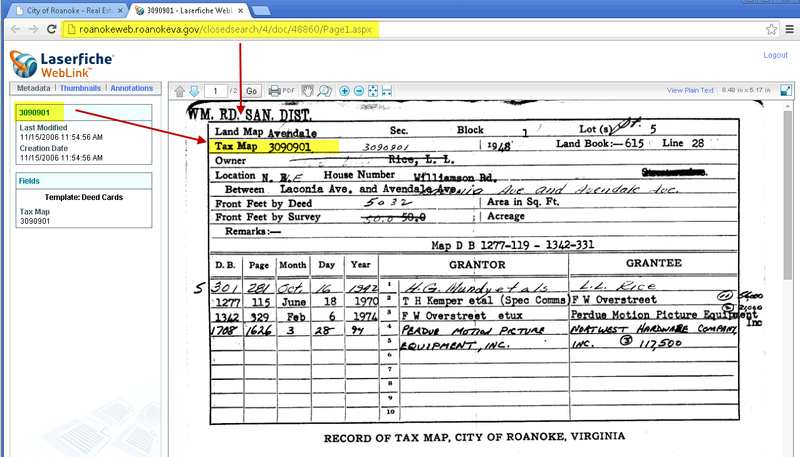 The tax ID number is the link between the GIS system and Laserfiche. 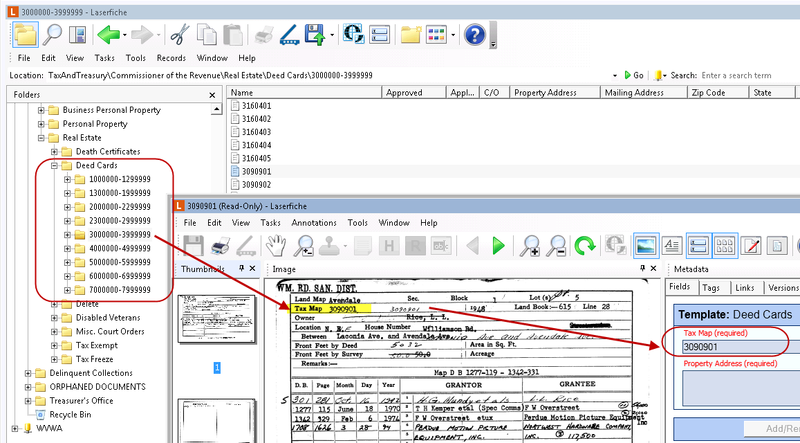 When the deed cards link (highlighted in the above screenshot) is clicked, the tax ID number is passed into Laserfiche WebLink’s closed search and the deed card stored on the Laserfiche server is displayed on the web. 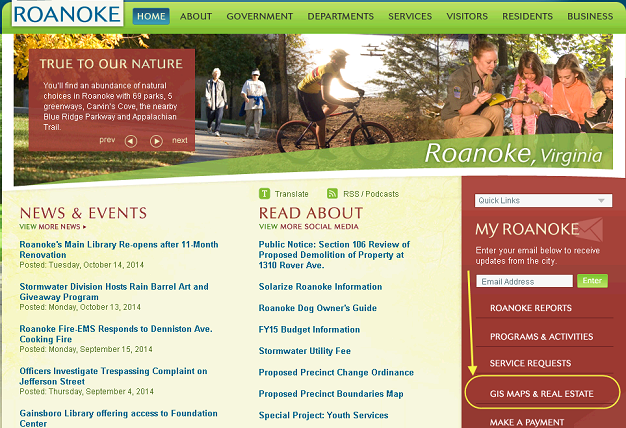 The web server (roanokeweb.roanokeva.gov) database id (dbid) is 4. The Laserfiche database id is obtained from the Laserfiche WebLink Administrator’s Utility. In this case the Laserfiche Server dbid is 3. [Deed%20Cards] corresponds to the Laserfiche template name. [Tax%20Map] corresponds to the field name in the template. 3090901 corresponds to the actual tax ID number for which the search is performed. The IBM Lotus Notes integration saves time by allowing employees to work within one system instead of toggling between two different programs. The GIS integration allows citizen to quickly search for public property records, such as deed cards without having to call the city first. Citizens appreciate having self-service access to this information, and city employees are freed up to perform other duties. 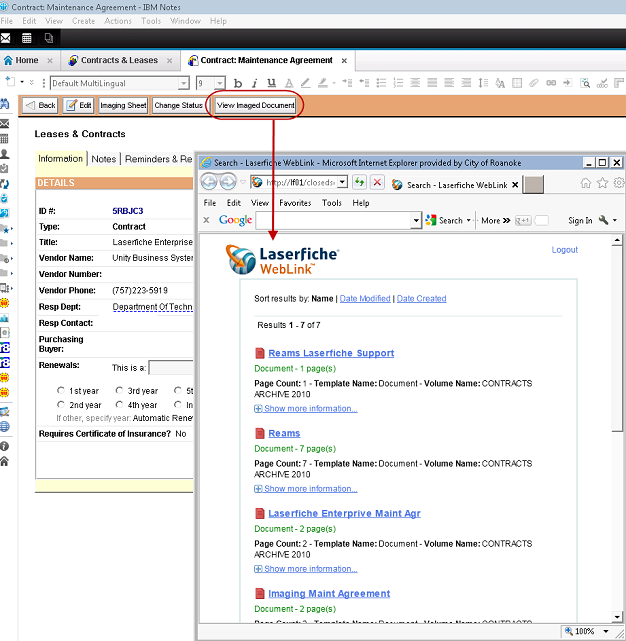 Want to see how Laserfiche can integrate with your line-of-business applications? Schedule a demo today.